My girlfriend bought these for me because she knows I like to collect them even though we almost only play via VTT nowadays, for obvious reasons (I don't live in the US). They look amazing, I love the supernova/magical design, it conveys a unique feel of powerful and cryptic alien technology, which is the main focus of the Adventure Path. The crit hit (and maximum number of each die) is a cool stellar explosion. The colour combination is also extremely appealing to me as I like contrasted combinations and I want the results of my rolls to really pop out, not hard to read from across the table. They seem to be sturdy and they are lightweight. Unfortunately I can't review how well they will withstand the test of time because I don't think I will make an intense use of them, however I can say that Q-Workshop products are good quality, in my experience. Obviously, I’m a sucker for branded products. How many times in my life am I going to play the Dead Suns adventure path? Once. Well, I might as well have the Dead Suns Dice Set then! This set comes with a standard set of 7 dice (d4, d6, d8, two d10s, a d12, and a d20) with a bluish-purplish background (don’t trust me on color!) The borders around each number are quite busy with little markings that I don’t really know how to describe (allegedly they’re “suggestive of vast galaxies and nebulae”), but frankly they don’t have a particularly “space adventure” vibe to me and seem closer to ancient Aztec or something. The highest number on each dice is a black hole (maybe a nova?). Frankly, the design looks a bit amateurish to me compared to other AP dice sets. On the other hand, everything is clearly legible and functional. I wouldn’t buy them as dice for dice sake, but if you’re a collector like me or just need a new set, they’re fine. As a side note, I love how the back proclaims they are “100%-official Starfinder Dead Suns Adventure Path dice.” What would 75% official dice look like? Oooh pretty! I might just have to pick these up. 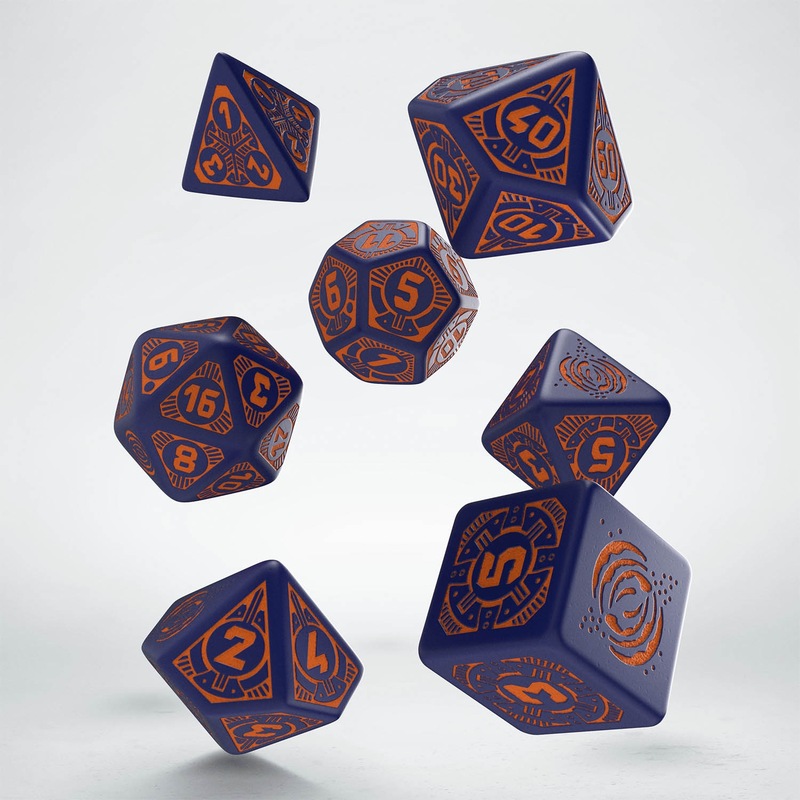 These look great, except I wish there wasn't the symbol in place of the highest number on each die. I want to see that 20!! But all the AP dice have been this way so it's a tradition at this point. Who am I kidding, they're so rad I'll buy them anyway. These dice—like many Starfinder products before them—were more popular than expected. We just received a new shipment, and they are back in stock! I bought two sets of these on amazon today! Looking forward to having them in my hands. When will the "Signal of Screams" dice be available? Is there any update on shipping these out? I ordered in January and I think it’s been showing backordered ever since. I can’t wait to roll them!